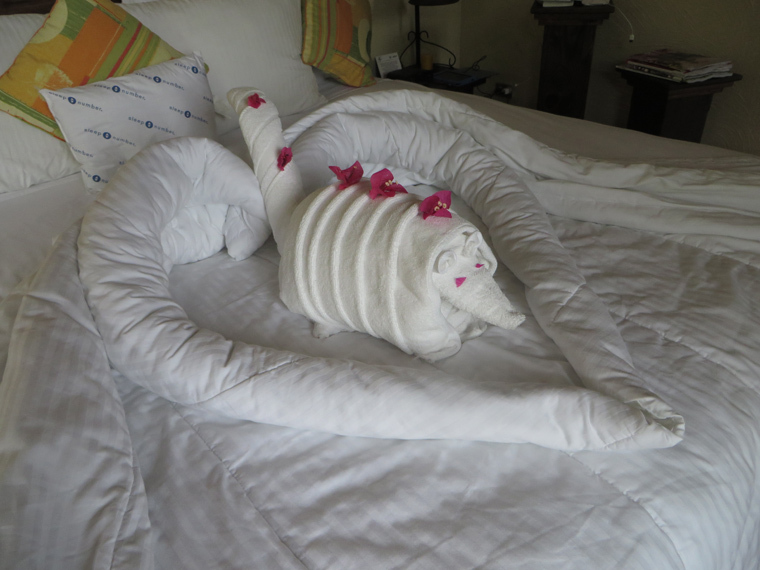 After five nights at Hacienda Pinilla, we said goodbye to our friends from the wedding and headed off to the Arenal-La Fortuna region for four nights. Along the way we enjoyed some pastoral green rolling hills in the foreground with the Pacific Ocean in the background. 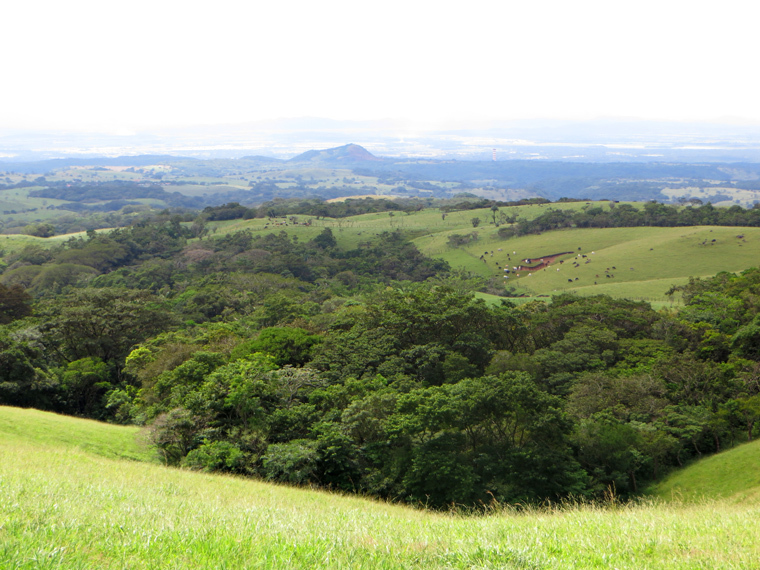 Costa Rican countryside looking west. 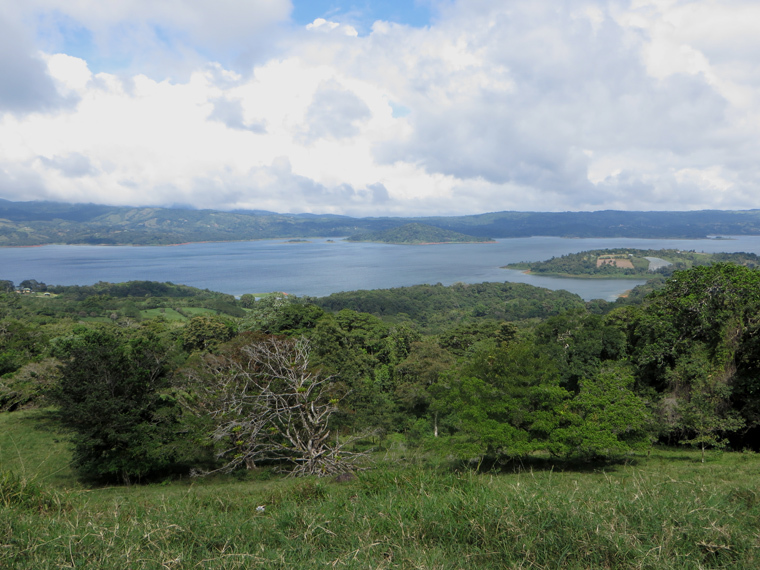 and Lake Arenal at the base of the Arenal volcano provided a picturesque setting. 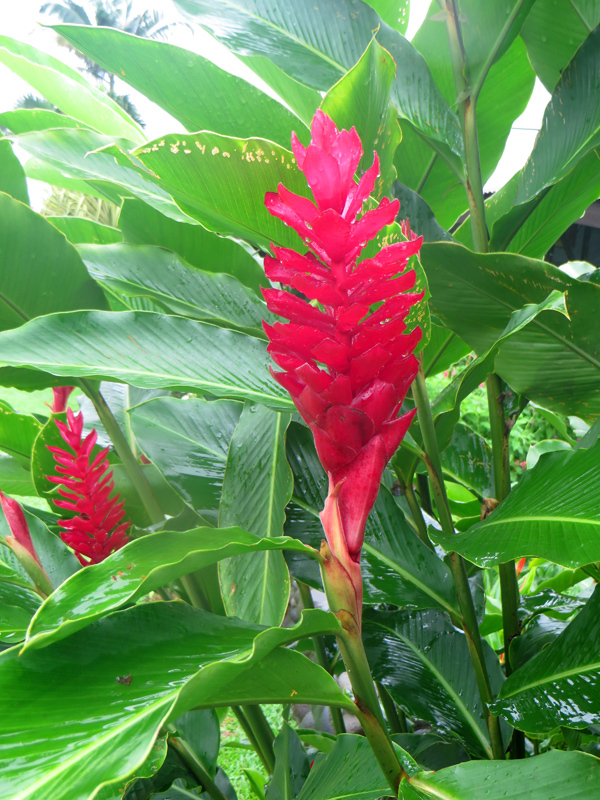 The Arenal area has become the adventure capitol of Costa Rica with tourists from all over the world. Zip lines, ATVs, hiking and white water rafting are just some of the activities available to the outdoor enthusiast. 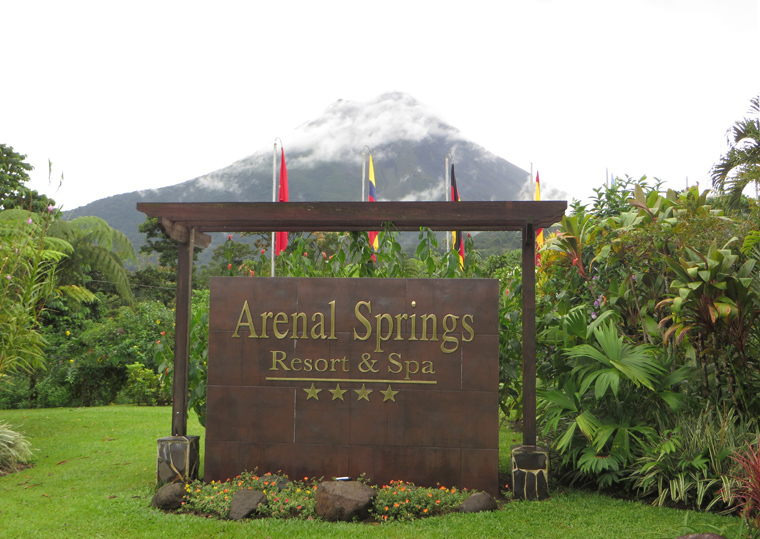 Arenal Springs Resort and Spa (1550 feet) would be our base of operations for the next four nights. 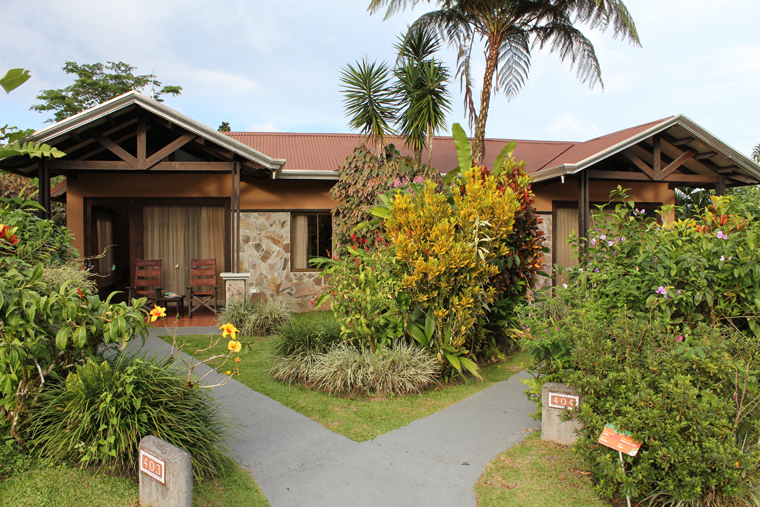 Arenal Springs Resort was very comfortable with many trees, bushes and flowers. 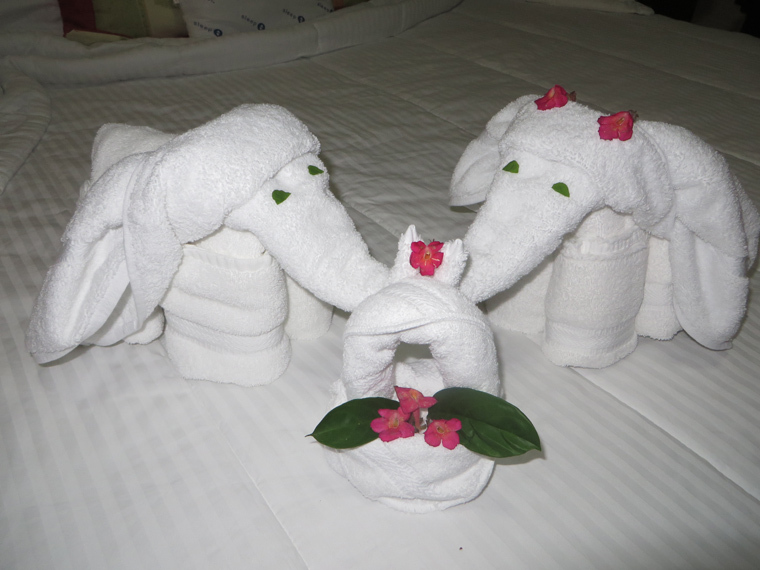 Linda particularly appreciated the fresh towels provided each day. The volcano is over 5400′ above sea level. Unfortunately, it was hidden under clouds most of our stay. 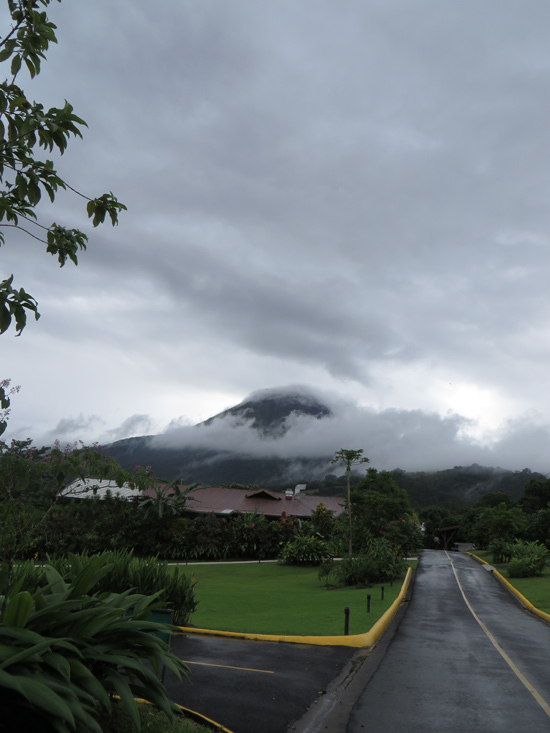 Clouds covering Arenal Volcano. 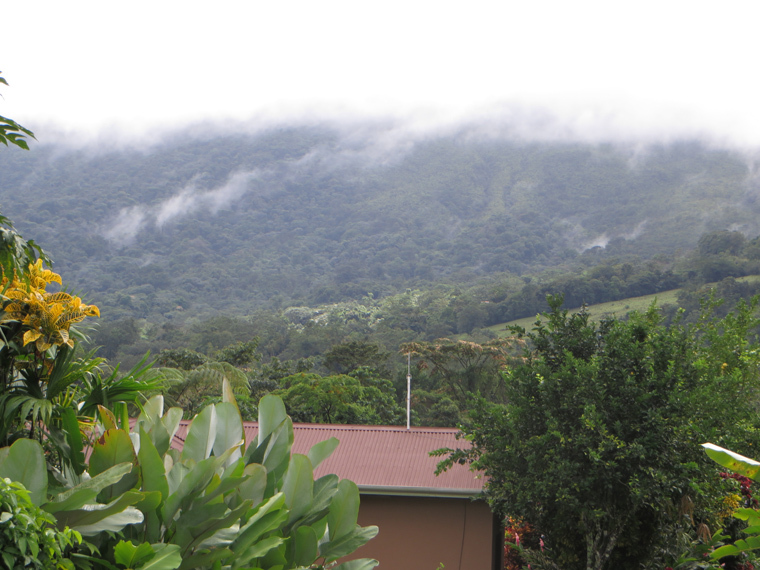 View from Arenal Springs Resort. It rained everyday that we were there. It rained hard and most of each day. Apparently a cold front had pushed south through the central part of the United States well into the Caribbean and low pressure was anchored off the coast. 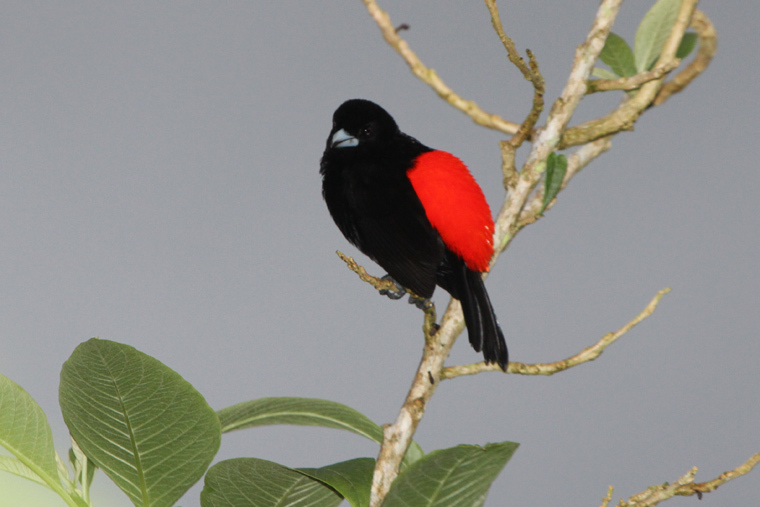 Occasionally the rain would stop long enough to photograph some of the very common birds on the Arenal Springs grounds. 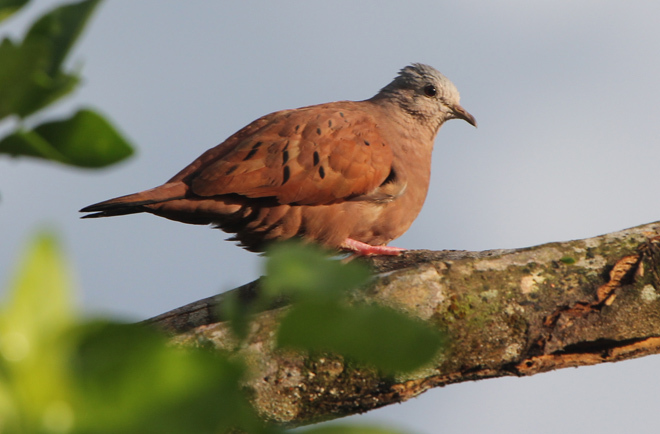 Ruddy Ground-Doves were always visible if it wasn’t raining too hard as were the Rufous-tailed Hummingbirds which seems to like ornamental plantings and gardens throughout Central America. 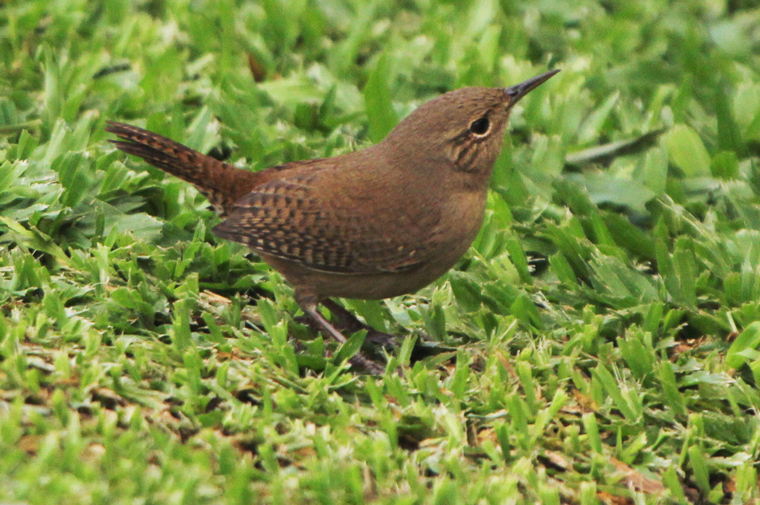 I was surprised to see House Wrens all over the place feeding on the grass between the buildings. 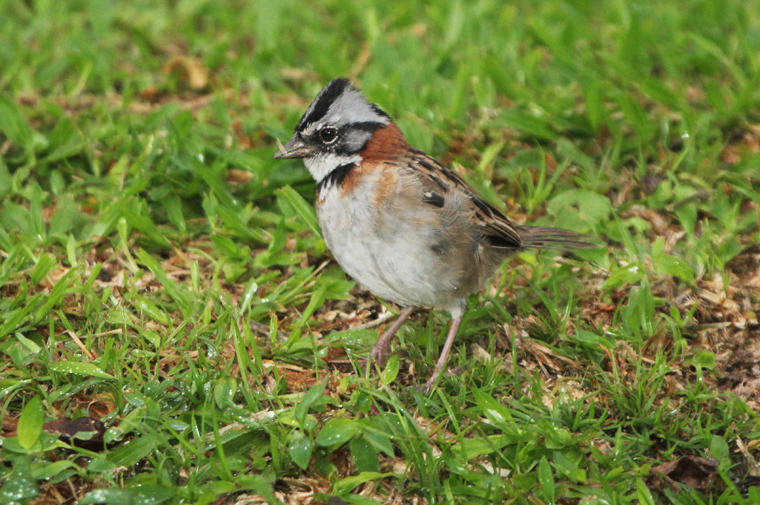 They were frequently joined by pairs of Rufous-collared Sparrows. Both Saltators were on the grounds though the Buff-throated was more common. Passerini’s Tanagers were very visible. Each duplex seemed to have their own pair of this tanager. The males are truly stunning. I was disappointed because the constant rain kept us from enjoying the beautiful scenery to its fullest. It undoubtedly negatively affected the birds that I did see and it was way to cool out to hope for snakes at night. Between rain showers, we were able to find a couple of interesting frogs. 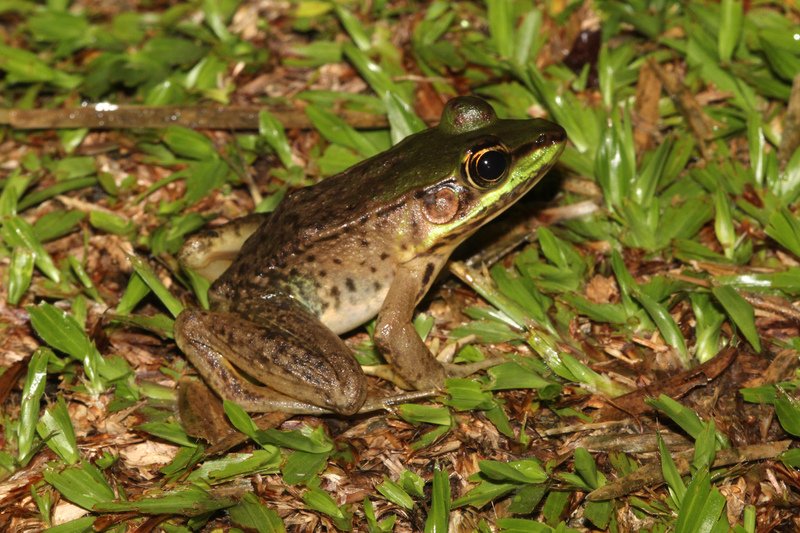 Several Vallient’s Frogs would feed on the grass near some of the artificial ponds at the resort. 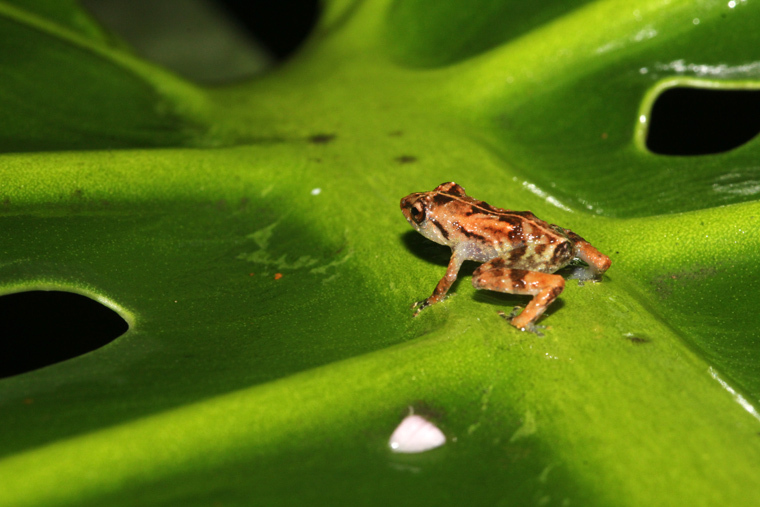 Tink frogs liven up the night with their loud chimes through out the Caribbean rainforest. Its one of the loudest night sounds you’ll hear during the rainy season. 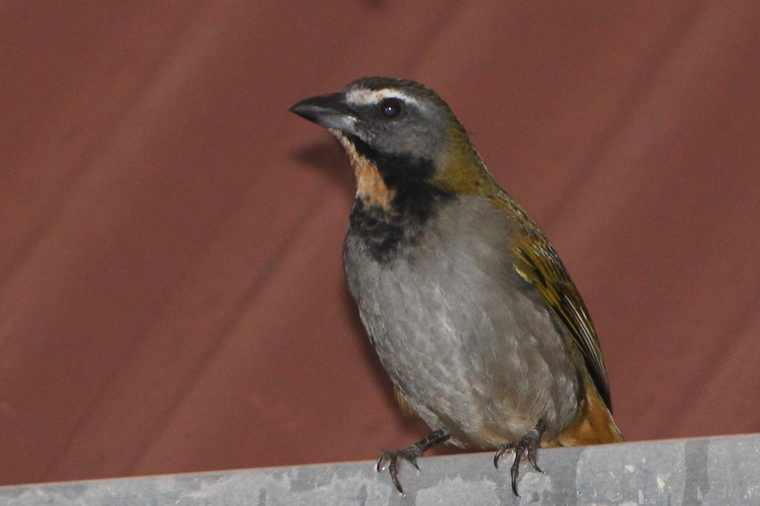 Adult males, which are the ones that do the calling, measure just over twenty millimeters. We were lucky to find this female on a large leave at eye level. 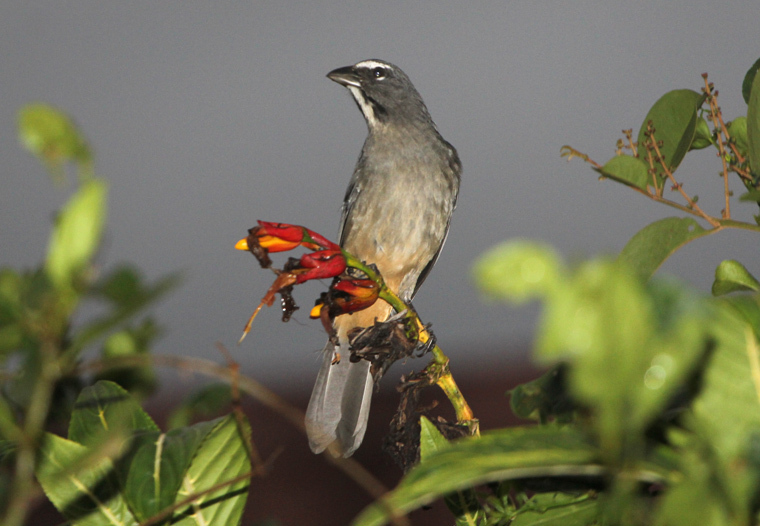 Most often the males call from inside a palm frond or similar type of vegetation like this male. 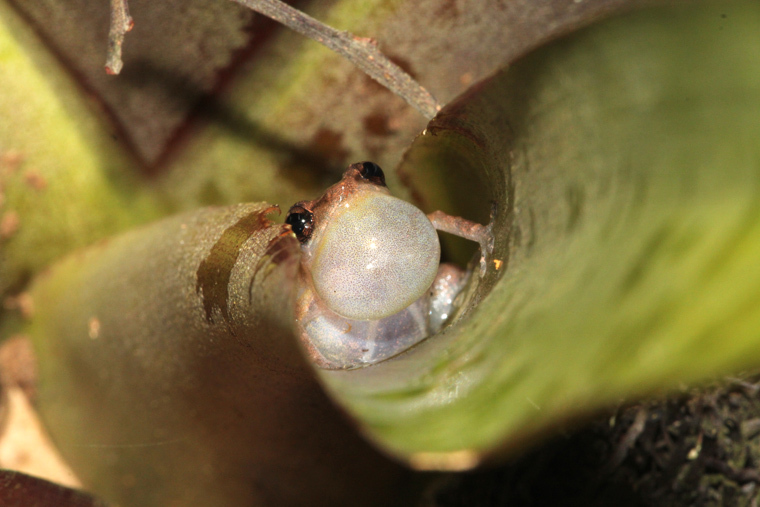 Male dink frog calling from a safe hiding spot. 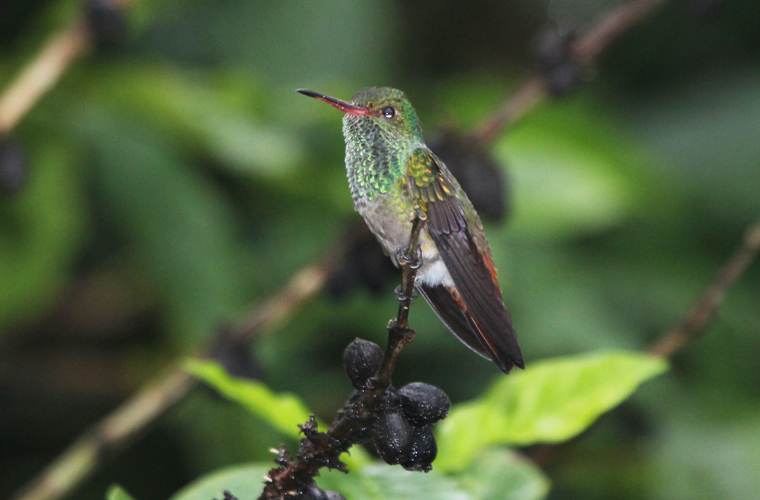 Despite the almost constant rain in Arenal, there were a few highlight moments. The last full day I birded with Juan Diego Vargas, an enthusiastic birder and guide, who was very competent with the birds of Costa Rica. There were two highlights that I’d like to share. 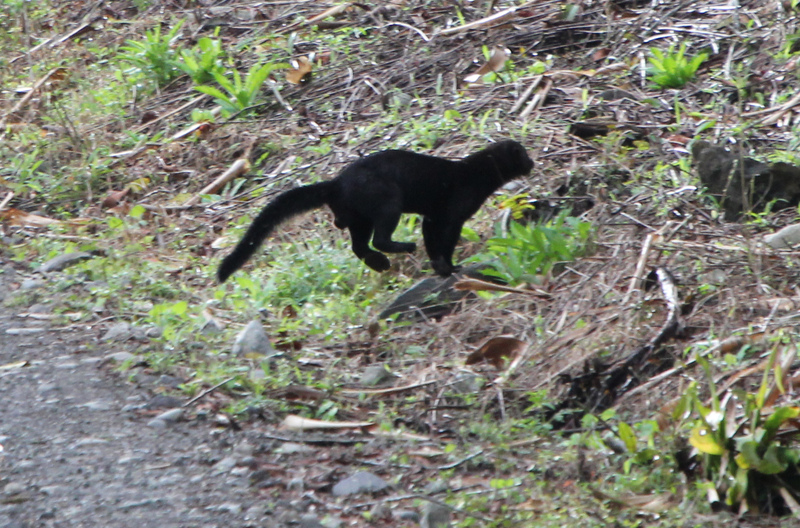 First was this Tayra that ran across the road twice in Arenal National Park. The tayra (Eira barbara) is a member of the weasel family, which also includes otters, skunks and minks. . Tayras can be found in the neo-tropical forests of Central and South America, and ranges from Mexico, south to Bolivia and northern Argentina and also on the island of Trinidad. 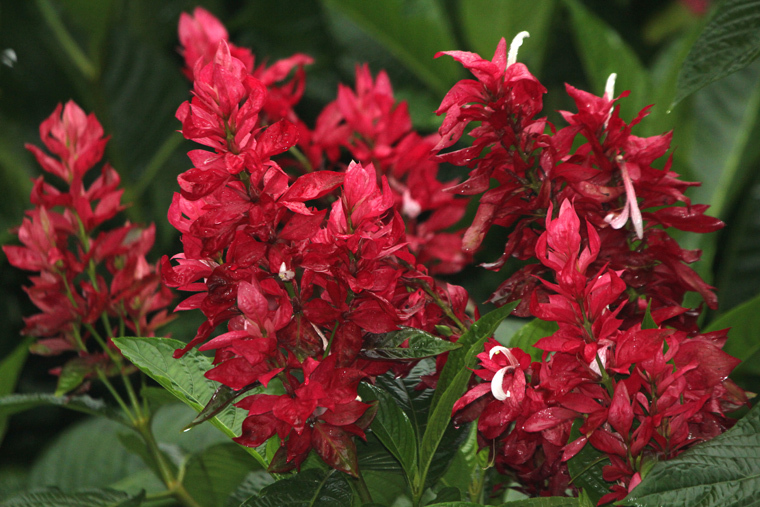 In these areas they live in tropical, deciduous and evergreen forests, secondary growth, fields and plantations. After raining all morning, the sun finally began to shine. 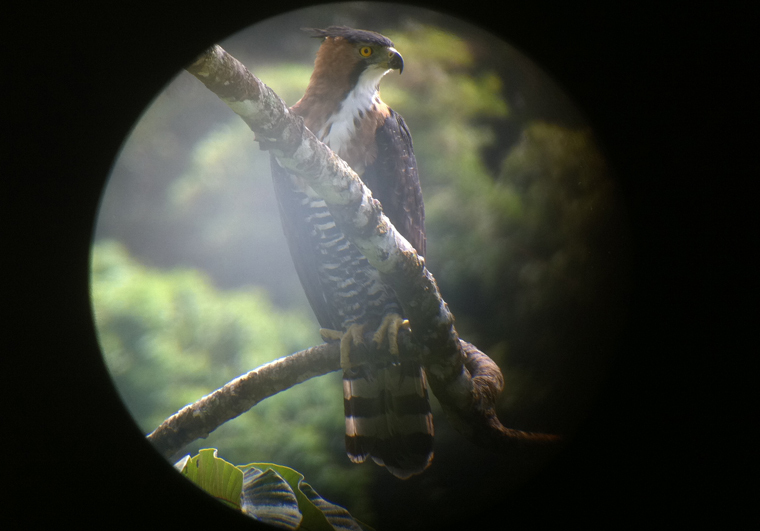 Juan Diego and I had just turned up a Spotted Antbird on one of the trails in Skytrek when he received a phone call from another guide that there was an Ornate Hawk-Eagle perched in a tree. We ran/scrambled about a half mile up the trail to a viewing platform. 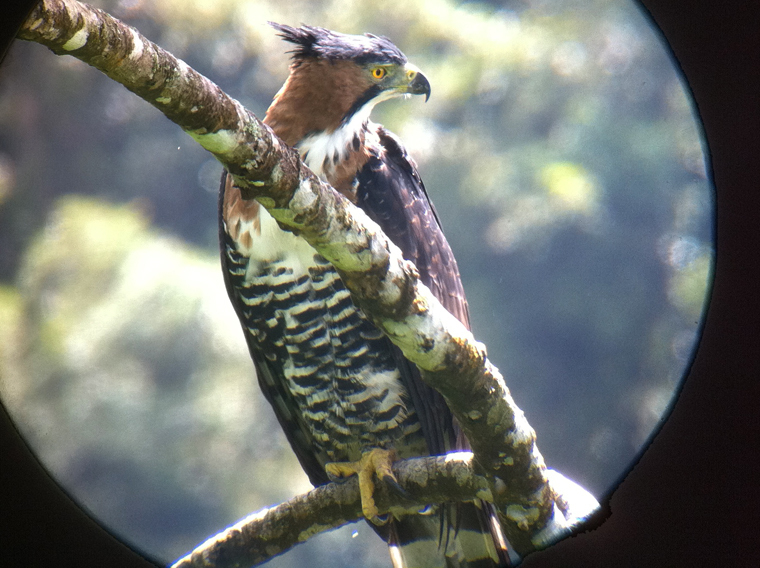 There only twenty yards away, perched at eye level was a stunning adult Ornate Hawk Eagle. Unfortunately I didn’t have my camera (too rainy) but was able to fire off a few shots with my eye phone pressed against Juan Diego’s telescope. 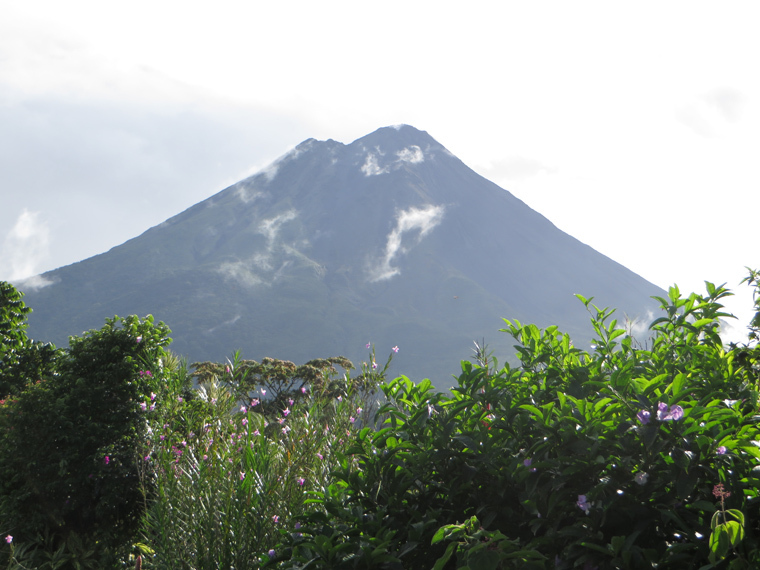 At the same moment, the clouds parted over the Arenal Volcano and Linda was quick to take advantage with some great scenery shots. 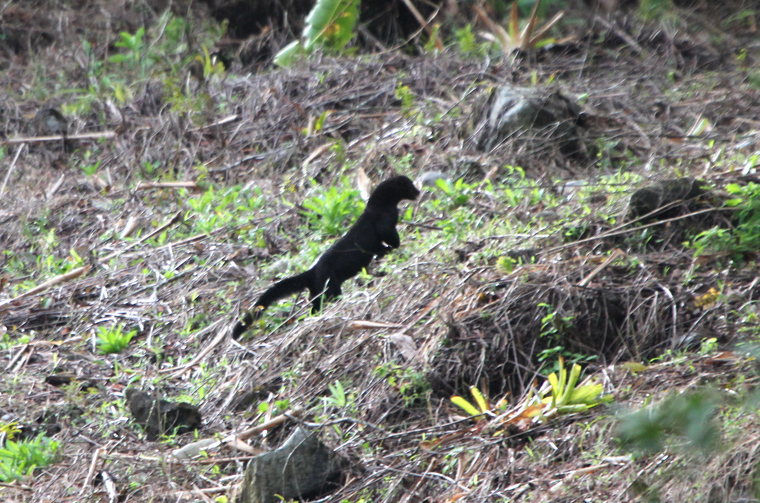 Excellent tayra pictures. Also, I think the saltators and tanager are lifers for me.